I have so much candle making information spread throughout this site that it often confuses newcomers. This article will enable you to get started as easily as possible. Since many of my feature articles were not written in any specific order, it will also help you read them in the correct order. Once you have familiarized yourself with the basics, pick an easy project, collect some materials, and get started. Items marked with an asterisk (*) should be considered mandatory reading. First and foremost with any candle making is safety and fire prevention. Although candle making is fairly safe when done properly, it is extremely hazardous when not done properly. Once you have learned the safety rules, it is time to familiarize yourself with Basic Materials and Basic Procedures. This article deals primarily with making a molded candle, however much of the information applies to all types of candles. Candle Measures - Candles are usually made with a mixture of ingredients, generally referred to as a formula or recipe. As with cooking, it is desirable to be able to mix your formula with a fair amount of accuracy. Contrary to popular belief, the correct wick size for each mold cannot be found on a chart. The proper size wick for any application is determined as much by wax formula as it is by candle diameter. The most commonly asked questions about candle making involve wax shrinking when cooled. Information on why it shrinks, when is it desirable, and how to reduce shrinkage when undesirable can be found in Candle Shrinkage. Although the above information is a good start towards becoming a candle maker, this site offers a wealth of additional information as well. 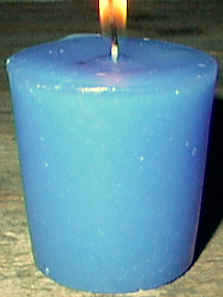 The Candle Instruction Index offers links to more advanced and specialized candle making topics. Many project instructions are also available. Most are rated by difficulty, and illustrated with step by step instructions.